WinDForce Management Services Pvt. Ltd.
Vinod founded EVI in 1999, and WinDForce, a subsidiary of EVI, in 2008, along with Jami Hossain. Under his leadership EVI group has grown into a multinational organisation with presence in a number of countries and with a client base that spans well known corporate, governments and UN organisations. Vinod is an innovator and had led development of a number of pioneering ventures relating to sustainability and renewable energy sectors as hydro, solar, wind, bio-mass etc. Vinod's expertise lies in Financing, Policy, commercializing new Technologies and new Business models to accelerate the adoption on sustainability. Before starting EVI, Vinod had experience in top level consulting, cross border mergers and acquisitions and corporate finance. 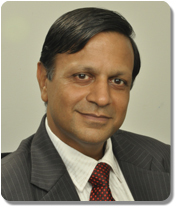 Vinod is a post graduate in Management from IIM Ahemdabad (1986) and a Mechanical Engineer from MNIT Jaipur(1983). To be a leading international wind energy services company providing cutting edge scientific and engineering solutions. To engage with diverse clients across the world in creating significant value for them by innovative problem solving approaches leveraged by strong knowledge base and reliable and high quality delivery processes. © Copyright 2011 windforce-management.com All rights reserved.